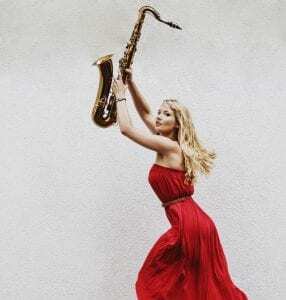 Fabia Mantwill is a Berlin-based saxophonist, vocalist and composer increasingly seen as a rising German jazz musician. Her diverse output encompasses work as a bandleader, collaborator, contemporary composer and improviser. Recent highlights have included tours to India, Brazil, West Africa and, in March 2016, an invitation to the prestigious Betty Carter’s Jazz Ahead Residency with performances at The John F. Kennedy Centre in Washington D.C. and The Apollo Theatre in New York. She has been selected for the Banff International Workshop for Jazz & Creative Music 2017 in Canada. She has performed with the Metropole Orkest Academy 2016 in Hilversum (NL) and was a member of the LaJJazzO Brandenburg, conducted by Jiggs Whigham. In summer 2015, she was leading a two-months music program in Accra, training Ghanaian musicians and actors. Fabia’s work as bandleader and composer bridges several distinct musical worlds from jazz to folk to classical, featuring the bespoke Fabia Mantwill Orchestra. She performs regularly with a variety of ensembles, e.g. the renowned Swiss electro band YELLO and her own groups such as the Fabia Mantwill Quintet, the Trio Moyoni and the Duo YRJON. Fabia Mantwill holds a Bachelor of Jazz Music awarded by the Jazz-Institute Berlin and Sibelius Academy Helsinki. She has studied and worked with jazz luminaries such as Tyshawn Sorey, Jason Moran, Vijay Iyer, Gretchen Parlato, Eric Harland, Greg Cohen, Kurt Rosenwinkel, Linda May Han Oh, Mark Guiliana, Fabian Almazan, amongst others.